The New England Black Wolves (5-4) got their retribution Sunday against the visiting Philadelphia Wings (2-8). 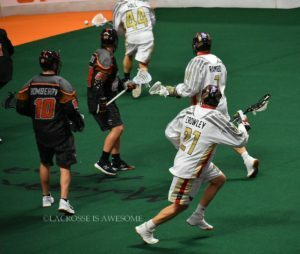 Saturday, the Wings defeated the Black Wolves in Philly and the frustration of losing to a then 1-7 team came through at the end for New England. In response to the tough loss that dropped them to .500 on the season, New England put together an excellent team win at home. “We responded to a game where we weren’t our best; Philly kind of took it to us,” said Head Coach Glenn Clark. “Credit to them, they played hard and really worked us last night so we really needed that kind of response.” The game was also Kevin Crowley’s first as a visitor in the Mohegan Sun Arena and the fans let him hear how upset they were at his trade request. Every time The Big Cat touched the ball in the first quarter, he was met with a sea of boos. Despite a slow start for the second night in a row, the Black Wolves raced ahead and never looked back. Final Score: Philadelphia-11, New England-17. Doug Jamieson started in net for the Black Wolves after coming in to relieve Alex Buque in Philadelphia the night before. “It gave me a little confidence,” said Jamieson. “I had a rough outing against Buffalo a couple weeks ago. It was nice to go in and make some saves, get a little bit of confidence coming into today.” A little bit of tension spilled over from the night before and 15 seconds in, two players from each team went to the box for roughing. Despite the change of venue, the scoring started very similar. Philadelphia came out and scored the first two goals; both came on the power play. Blaze Riorden’s (2G, 1A) goal was followed by another from Jordan Hall (2G, 1A). The defense settled in and allowed the Black Wolves’ offense to close the first quarter on a three-goal run. Stephan Leblanc (4G, 3A) finally got the home team on the board with 5:56 remaining. The next goal really seemed to ignite New England. Captain Brett Manney (1G, 1A) ran in transition and got the assist from David Brock (1G, 3A), scoring his first goal of the season. Callum Crawford (5G, 7A) finished the run with 1:23 remaining to give the Black Wolves their first lead of the night. At the end of the first quarter, New England led Philadelphia 3-2. The Wings tied the game early in the second quarter on Hall’s second goal of the night. The rest of the quarter was owned by New England as they outscored Philadelphia 5-2 before the half. It started with a three-goal run with scores from Dereck Downs (1G); Tyler Digby (2G, 6A); and Greg Downing (1G). Downing’s goal came from up close as he fell into the crease in transition. That goal chased Doug Buchan from the Philadelphia net and Davide DiRuscio replaced him. Matt Rambo (2G, 4A) stopped the bleeding momentarily with his first goal of the game before Leblanc and Crawford each notched their second of the night. Kiel Matisz (2G, 2A) was able to get one back for the Wings scoring with 43 seconds remaining before the buzzer. At the half, New England led Philadelphia 8-5. The teams went back and forth to start the second half. Leblanc completed his hat trick 55 seconds in before Rambo got his hat trick at 2:29. Brock answered with a huge transition goal. When asked about the goal, Brock was very straightforward, “It felt good. It’s always nice to contribute.” The goal was his fourth on the season and he is now only three away from his career high of seven (2016 with Buffalo). Philadelphia strung together two goals to get within two with 7:22 left in the quarter. Kevin Crowley (2G, 2A) scored his first goal of the game, and first as a visitor in Connecticut before Riorden scored again on the powerplay. Reilly O’Connor (2G, 4A) answered with his own two goal run to get the lead back to four before the final quarter. At the end of three, New England led Philadelphia 12-8. Leblanc; Digby; and Crawford all scored within the first 2:10 to quickly put the game out of reach. The five-goal run going back to the third quarter gave the Black Wolves a seven-goal lead. New England was content with slowing the game down for the rest of the night. Josh Currier (1G, 5A) and Matisz scored to get the Wings back within five with 5:06 remaining. Two goals from Crawford, the second being an empty netter, cancelled those out. In garbage time, Crowley was able to find the net again to bring us to our final. Final Score: Philadelphia-11, New England-17. 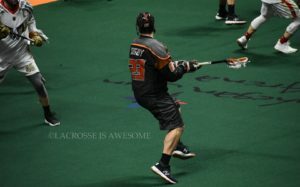 The New England Black Wolves (5-4) host the Toronto Rock (7-1) on Sunday, February 24 at 1:00 PM EST. The Philadelphia Wings (2-8) enjoy two weeks off before hosting the Buffalo Bandits on Friday, March 8 at 8:00 PM EST.